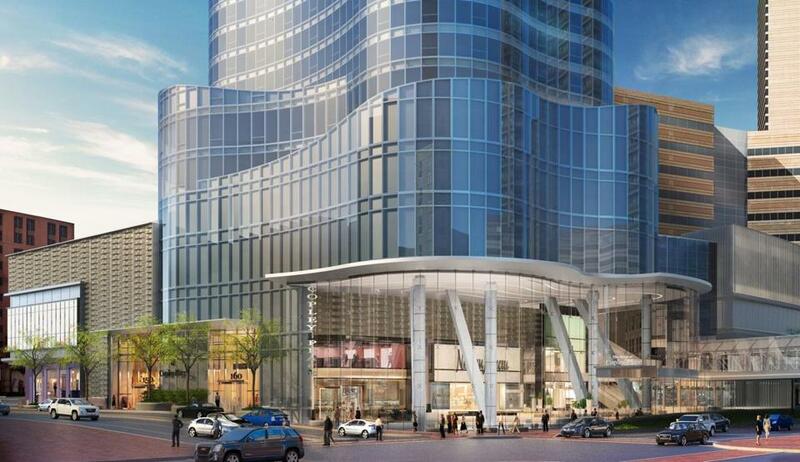 A street-level view of a proposed 52-story residential tower at Copley Place. In Boston’s surging real estate industry, Simon Property Group was one of the few developers holding back on ambitious plans to build hundreds of high-rise residences in the heart of the city. After an 18-month delay, the Indianapolis company said it wants to move forward with its planned skyscraper at Copley Place — and add another 224 residences to the building. The latest plan, which calls for 433 apartment and 109 condominiums, represents a 70 percent increase over the 318 residences approved for the project by Boston regulators in November 2011. Executives said that while the tower will have more units and floors, the height will remain at 569 feet, which would make it one of the tallest residential buildings in the city. The $500 million project, situated at the corner of Dartmouth and Stuart streets, would also include an expansion of the Neiman Marcus store and upgrades to the adjacent Southwest Corridor Park. The revised plan accommodates more residential units without changing the height of the building by reducing the average size of units. More floors are added by modestly reducing their height. The location of the proposed skyscraper. Simon hopes to start construction by spring 2015, but the timing depends on final approvals from regulators. The company is seeking to build its tower in state-owned air space over the Massachusetts Turnpike, and it still needs final engineering approvals from transportation officials. It also must get approval for the increase in units from the Boston Redevelopment Authority, which kicked off a review with a citizens advisory panel on Wednesday. Early reaction to the revised proposal was mixed. Some residents asked for more information about changes in the atrium and outdoor space, as well as the mix and location of affordable units. Others supported having more apartments in the tower; the prior plan included only condominiums. Thousands of residences are under construction across the city, with developers building high-rise apartment towers from the South Boston Innovation District to the West End to the Back Bay and the Fenway. Peterman said that adding a large concentration of rental units to the tower will help make the project financially feasible, regardless of the market cycle. Typically, such large projects can suffer if they flood the market with condominiums in a weak housing market. “Given the long lead time for construction, we wanted to make sure our program was going to survive whatever economy we were in,” he said. 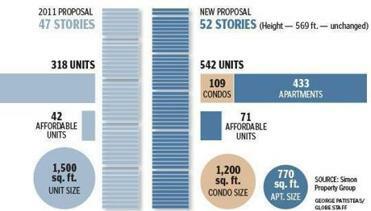 The changes in Simon’s project will increase the planned number of affordable units to 71 from 42. But state Representative Byron Rushing said the developer should be pushed to further increase the supply of such units and increase its financial contributions for public art and other upgrades. “I still find that the developer is making a low level of contributions for such a huge project,” said Rushing, a Democrat from Boston. Rushing and others offered support for design changes to the tower that would make its entry plaza and atrium more level with the street. The prior plan included a tiered entry that some had criticized as an unnecessary barrier that would discourage visitors from entering the public atrium. The company is expected to file a formal accounting of its revisions with the Boston Redevelopment Authority in coming weeks. Casey Ross can be reached at cross@globe.com.